Praz sur Arly is a pretty and traditional ski village which lies in the stunning scenery of the Haute-Savoie department in eastern France. The village is a near neighbour of the buzzing resort of Megève, and although relatively quiet is an ideal destination for novice and intermediate skiers who want great skiing and an authentic atmosphere for a very reasonable cost. Praz sur Arly has everything you need in terms of shops, restaurants, ski and other sports equipment hire and sales and general facilities, with its only drawback being that the aprés ski night-life is a little on the quiet side. However, even this isn't really a problem as the large and famous Megève is only three kilometres distant, so rip roaring nights out are easily found! The style of the village is traditional and authentic, and the views of Mont Blanc are breathtaking in winter or summer. The resort offers its best possibilities for novice and intermediate skiers, but experts can still access the more difficult slopes and off piste adventures by linking easily to neighbouring ski resorts. For variation on the theme of winter sports there are also cross country courses, slalom courses, snow shoe excursions, snow board areas and ski schools for children and beginners. A network of lifts provides access to all the pistes. Mont Blanc, which dominates the skyline, has possibilities for expert skiers to experience the ultimate off piste adventure with a guide, and this makes for an unforgettable day. Then there is the Mont-Blanc Tramway in St Gervais, only fifteen kilometres away, to experience, as well as the Aiguille du Midi cable car which takes you from 1030 metres to 3842 metres in eight minutes. With glaciers, waterfalls, gorges and lakes to explore too, the area as a whole offers stunning scenery. In summer this can be enjoyed by climbing, canyoning, swimming, fishing, pony trekking, mountain biking or hiking. Why not try hot air ballooning? 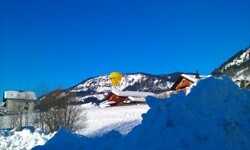 Praz sur Arly is well known for hot air ballooning, with two companies based in the town offering flights year round. In January the Hot Air Balloon Week and Transalpine Challenge are held. Paragliding and hang gliding are also on offer. There are numerous lovely Alpine villages to discover in the area, some of which still demonstrate and practice traditional crafts and mountain agriculture, offering opportunities to purchase local produce such as hand-made cheeses. And for those seeking a more lively atmosphere, the well known and very popular resort of Megève is of course on the doorstep. To reach the resort by air you could fly to Geneva, Chambéry or Lyon, which are served by a variety of airlines including budget operators. The nearby resort of Sallanches which is only seventeen kilometres away, has a TGV railway station with shuttle links to Praz sur Arly. If you are arriving under your own steam by road you will find the village by taking the A6 to Macon and then the A40 in the direction of Sallanches. The town lies on the D1212. Whilst not cheap, as Alpine property rarely is, the market in Praz sur Arly has properties on the market for considerably less money than those in neighbouring larger resorts such as Megève. The style of the chalets tends to be traditional, blending with the landscape and in keeping with the authentic feel of the village. Do you know Praz sur Arly better than we do? Do you have photos of Praz sur Arly? WHERE IS Praz sur Arly? Praz sur Arly is in eastern France. It lies in the south of the Haute-Savoie department, close to the border with the Savoie department. Access: By air: Fly to Geneva, Chambéry or Lyon. By rail: There is a TGV railway station at nearby Sallanches. By road: Take the A6 to Macon followed by the A40 in the direction of Sallanches. Economy: The economy is based on mountain tourism, with agriculture also significant. Interesting fact: In January of every year, Praz sur Arly hosts an international hot air balloon festival, which is a spectacular event.